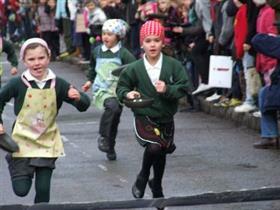 Children from Olney Middle School and Olney Infants School take part in their own pancake races, on a special course on one side of the Market Place. Their route is usually packed with cheering supporters and proud parents. The races are organised for boys and girls and by age.